Margaret Deland was an American poet and novelist who also wrote short stories. She belonged to the literary realism movement that prevailed during the late 19th and early 20th centuries. This prolific writer had over thirty books to her name. She was born Margaretta Wade Campbell on the 23rd February 1857 in Allegheny, Pennsylvania. Tragically her mother died giving birth so she was raised by an aunt and uncle. Her education was taken at private schools and the Cooper Union in New York City. For a short time she worked as a teacher of drawing. Margaretta married a publisher named Lorin F Deland in 1880 whose output included the production of greetings cards. She soon found her own niche in this business, writing verses for the cards. Encouraged by her success in this she had her first collection of poems published in 1886 under the title The Old Garden. When her husband sold the company they moved to Boston and lived fairly affluently, being able to also purchase a property in Kennebunkport, Maine as a summer residence. They kept this house for the next fifty years or so. 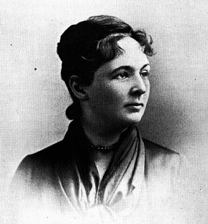 She was also an outspoken critic of some religious faiths such as Calvinism and her 1888 novel, John Ward, Preacher was an indictment of the movement. The book became a best seller. Following her work in France she published a series of articles called Small Things in 1919. Margaret Deland died in her last place of residence, Boston’s Hotel Sheraton, on the 13th January 1945. She was 87 years old.